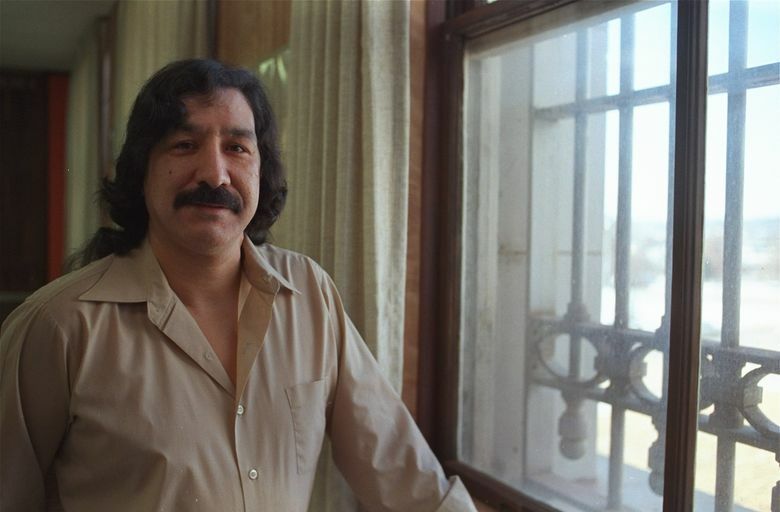 A federal judge says a free-speech lawsuit filed by convicted murderer and American Indian activist Leonard Peltier over the removal of his paintings from a state exhibit in 2015 can go forward. Claims by convicted cop killer and Native American activist Leonard Peltier that Washington state violated his First Amendment rights by removing his paintings from a public exhibition are supported by evidence and the law and should go to trial, a federal judge has ruled. U.S. District Judge Ronald Leighton, in an 18-page order issued Monday in Tacoma, found that the Department of Labor & Industries (L&I) failed to show a “compelling government interest” when it removed Peltier’s paintings from an exhibit in its lobby during Native American Heritage Month in 2015. Government censorship, the judge said, requires getting over a very high legal bar. “Freedom of speech, though not absolute, is protected against censorship or punishment, unless shown likely to produce a clear and present danger of a serious substantive evil that rises far above public inconvenience, annoyance or unrest,” Leighton wrote in denying the state’s motion to dismiss the lawsuit against L&I Director Joel Sacks and his public-information officer, Tim Church. Leighton did, however, dismiss a number of other claims Peltier had filed against the state, including allegations of emotional distress, and dropped Gov. Jay Inslee from the lawsuit. Peltier has been a divisive figure in American politics, entertainment and law-enforcement circles for more than 40 years. He was convicted in 1988 for the murders of two FBI special agents a few years earlier on South Dakota’s Pine Ridge Indian Reservation. He remains in prison. Depending on whom you ask, Peltier is either a coldblooded killer or a scapegoat who symbolizes the government’s oppression against Native Americans. In 2015, L&I exhibited several of his paintings in its lobby, drawing the particular ire of a pair of retired FBI agents who have made it a mission to see that Peltier’s crimes and victims are not forgotten. 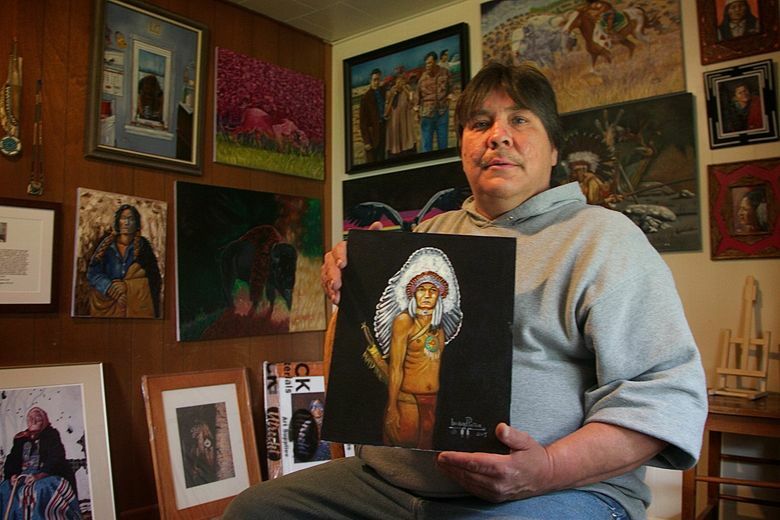 Those men, Edward Woods and Larry Langberg, wrote Inslee and Sacks questioning the decision to display Peltier’s art. The paintings were removed two weeks early because they conflicted with “L&I’s message” and were controversial, according to court pleadings. Woods and Langberg were dismissed from Peltier’s lawsuit earlier, and Peltier was ordered to pay them $17,000 in costs and attorneys fees for having to defend themselves against the action. The only claim remaining alleges the state violated Peltier’s First Amendment rights — whether he’s a killer or not — by cutting short his right to express himself without justification. In drawing that conclusion, Leighton relied on the U.S. Supreme Court ruling in Citizen’s United vs FEC, which concluded in the context of campaign financing that corporations are individuals, holding that they have the same rights to free speech as people. Likewise, so do convicted killers. “By taking the right to speak from some and giving it to others, the Government deprives the disadvantaged person or class of the right to use speech to strive to establish worth, standing, and respect for the speaker’s voice,” Leighton wrote. A telephone message seeking comment from the state Attorney General’s Office, which is defending the lawsuit, was not immediately returned. Even if the forum had been limited, the judge said the evidence — when viewed in a light most favorable to Peltier’s position — showed that removal still would not have been allowed. Because Sacks and Church both personally participated in the removal of the paintings, the judge said they could not claim immunity and can be held liable.